COLLECTIVE AND INDIVIDUAL EXPOSITIONS June 1983 :	Collective Expositions in the high School Al Khansaa in Casablanca. June 1984:	Collective Expositions in the C. P. R. Plastic arts in the Rabat Bab Rouah Gallery. Jam 1999:	First individual Exposition in the Casablanca Plastic arts school March 1999	collective Expositions to the occasion of the Woman World-wide day in the Rabat Bab El K�bir Gallery March 1999:	Artistic collective Expositions in the 4th Plastic arts Spring in the Essaouira Urban development center April 1999:	Collective Expositions in S�te and Montpellier France, to the occasion of the � Times of Morocco �. June 1999:	collective Expositions - under the theme �Creativity and development � - in the Casablanca Kamal El ZAABDI cultural center - to the occasion of the 2nd Ben M'Sick Festival July 1999. :	Collective Expositions to the occasion of the cultural days in the Casablanca A�n Seba� Municipal cultural Theater. D�ce1999:	Collective Expositions of the Ramadan month cultural days in the Casablanca Kamal EL Zaabdi cultural Center. Janv 2000:	individual Expositions under the theme � Poetry of water � in the Casablanca Sidi Belyout cultural complex May 2000 :	collective Expositions in the Casablanca A�n Seba� municipal theater June 2000 : Participations in the Casablanca cultural matters delegation regional exposition.  Realization of a wall fresco in the Casablanca Cultural Matters Ministry delegation Nov 2000 :	Individual Expositions in the framework of the cultural activities of the University Hassan II A�n Chock Sciences Faculty. F�v 2001:	Collective Expositions to the occasion of the fifth Taza plastic art national encounter. April 2001 :	Individual Expositions Under the theme "Reflections" in the Casablanca ministry of the culture delegation gallery. Aug 2001 :	Participations to the 3rd session of Casablanca Human space Nove 2001 :	Collective Expositions To the saint of artist painter LARBI BELKADI in the Casablanca Sidi Belyout cultural complex. . March 2002: Participations in the first CHOUAÏB DOUKKALI UNIVERSITY letters and Human sciences Faculty - Plastic Arts university encounter in El Jadida. Aug 2003:	participations in the 5th Agadir plastic arts summer encounter 	1st price in Art symbolic by ACEA, international Federació of artists pl�stics. April 2004:	Participation in the 6th Agadir plastics arts summer spring encounter, Under the theme � the plastic arts in the service of acculturation�. May 2004:	Participations to a collective exposition in the framework of the 9ÉME edhec cultural week. 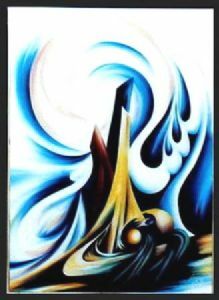 Aug 2004	Participations to the 14th Barcelona (Spain)international exposition F�vr2005 :	Collective Exposition to the Lydec space under the theme � five and five � paint of ten artists of Casablanca - Azmmour and El Jadida. March 2005:	Participations in the contemporary art exposition of the Casablanca plasticiens in the sacred core cathedral. May 2005:	Participations to the first national Contemporary art parlor - under the theme � Generations and tendencies � March 2006	collective Expositions in the Casablanca A�n Seba� municipal theater - under the theme "Creation with the service of the human development " June 2006	Individual Expositions to the siege of advises area casablancais June 2007	Participation in the 3th forum of creativity to the forum of the culture Casablanca (cath�drale sacr� coeur) under the topic creation & freedom Dec 2007	Collective exhibition in hall of the anfa's out door space gallery in Casablanca. January 2008	Participation in the national exhibition in the theater MED V in Rabat Mars 2008	Participation in the national exhibition in the theater MED V in Rabat. April 2008	Individual exhibition in the commerce, industry and service's chamber of Casablanca. March 2009Participation to the first international meeting of the plastic arts in Meknes March 2010Collective exhibition to the festival of art and education in Tite Mellil and in M�diouna April 2010Participation to the 2nd edition of the international meeting of the plastic arts and the photography under the theme "the image ferlies and the color's allegory" in Mekn�s April 2010Participation to the 8th international festival of the plastic arts and the photography in Fes : :.